This entry was posted in Health & safety solutions on 2017/08/02 by Susan. Smoke from B.C. wildfires is causing terrible air quality in some regions. 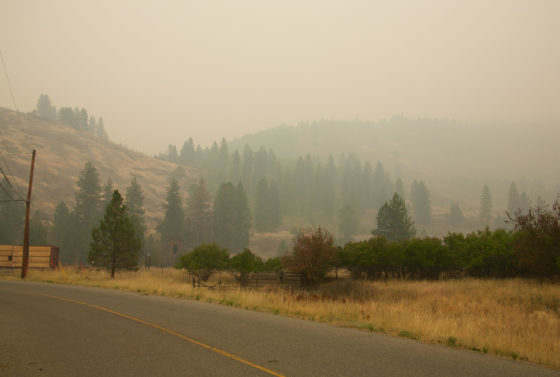 How can outdoor workers and volunteers protect themselves from forest fire smoke? This question is on the minds of many in B.C. as forest fire season continues with a vengeance. It states that, in general, long-term health risks from short-term exposure to low or moderate levels of smoke during wildfires are quite low. People with pre-existing conditions like asthma or allergies may have aggravated symptoms. Others may feel irritation of the eyes, nose, and throat, but these symptoms are generally temporary. The FAQs also remind employers to remember the hazards associated with heat stress, which I wrote about in my post Working in the hot sun. Working in the heat may at first just feel uncomfortable, but it can lead to serious health complications and even death in extreme cases. Ensure that workers stay hydrated by drinking lots of water. Sometimes, when the fire gets close enough, work crews need to evacuate. In my post Evacuating workers when there’s a forest fire nearby, I shared a story from someone who used to work as a treeplanter. You can call WorkSafeBC’s Prevention Information Line at 1.888.621.7233 (1.888.621.SAFE) if you have any questions about safety at your workplace. Do you have a FAQ that does apply to fire fighters? Thank you for asking, Steve. I will get back to you on this ASAP.